Cyanotic heart disease refers to a group of many different heart defects that are present at birth (congenital). They result in a low blood oxygen level. Cyanosis refers to a bluish color of the skin and mucous membranes. Normally, blood returns from the body and flows through the heart and lungs. Blood that is low in oxygen (blue blood) returns from the body to the right side of the heart. The right side of the heart then pumps the blood to the lungs, where it picks up more oxygen and becomes red. The oxygen-rich blood returns from the lungs to the left side of the heart. From there, it is pumped to the rest of the body. The blood that is pumped out to the body is lower in oxygen. Less oxygen delivered to the body can make the skin look blue (cyanosis). Some of these heart defects involve the heart valves. These defects force blue blood to mix with red blood through abnormal heart channels. Heart valves are found between the heart and the large blood vessels that bring blood to and from the heart. These valves open up enough for blood to flow through. Then they close, keeping blood from flowing backward. Tricuspid valve (the valve between the 2 chambers on the right side of the heart) may be absent or unable to open wide enough. 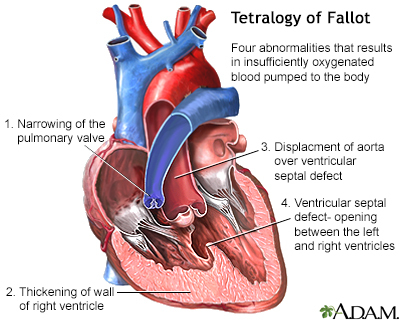 Pulmonary valve (the valve between the heart and the lungs) may be absent or unable to open wide enough. Aortic valve (the valve between the heart and the blood vessel to the rest of the body) is unable to open wide enough. Some heart defects cause major problems right after birth. The main symptom is cyanosis is a bluish color of the lips, fingers, and toes that is caused by the low oxygen content in the blood. It may occur while the child is resting or only when the child is active. Some children have breathing problems (dyspnea). They may get into a squatting position after physical activity to relieve breathlessness. Infants may get tired or sweat while feeding and may not gain as much weight as they should. Fainting (syncope) and chest pain may occur. Physical examination confirms cyanosis. Older children may have clubbed fingers. The doctor will listen to the heart and lungs with a stethoscope. Abnormal heart sounds, a heart murmur, and lung crackles may be heard. The treatment of choice for most congenital heart diseases is surgery to repair the defect. There are many types of surgery, depending on the kind of birth defect. Surgery may be needed soon after birth, or it may be delayed for months or even years. Some surgeries may be staged as the child grows. Your child may need to take water pills (diuretics) and other heart medicines before or after surgery. Be sure to follow the correct dosage. Regular follow-up with the provider is important. Many children who have had heart surgery must take antibiotics before, and sometimes after having any dental work or other medical procedures. Make sure you have clear instructions from your child's heart provider. Ask your child's provider before getting any immunizations. Most children can follow the recommended guidelines for childhood vaccinations. The outlook depends on the specific disorder. Women who are pregnant should get good prenatal care. Avoid using alcohol and drugs during pregnancy. Tell your doctor that you are pregnant before taking any prescribed medicines. Get a blood test early in the pregnancy to see if you are immune to rubella. If you are not immune, you must avoid any exposure to rubella and should get immunized right after delivery. Pregnant women with diabetes should try to get good control over their blood sugar level. Some inherited factors may play a role in congenital heart disease. Many family members may be affected. If you are planning to get pregnant, talk to your doctor about screening for genetic diseases. Bernstein D. Cyanotic congenital heart disease: evaluation of the critically ill neonate with cyanosis and respiratory distress. In: Kliegman RM, Stanton BF, St. Geme JW, Schor NF, eds. Nelson Textbook of Pediatrics. 20th ed. Philadelphia, PA: Elsevier; 2016:chap 429. Cardiac catheterization is used to study the various functions of the heart. Using different techniques, the coronary arteries can be viewed by injecting dye or opened using balloon angioplasty. The oxygen concentration can be measured across the valves and walls (septa) of the heart and pressures within each chamber of the heart and across the valves can be measured. The technique can even be performed in small, newborn infants. Clubbing may result from chronic low blood-oxygen levels. This can be seen with cystic fibrosis, congenital cyanotic heart disease, and several other diseases. The tips of the fingers enlarge and the nails become extremely curved from front to back. 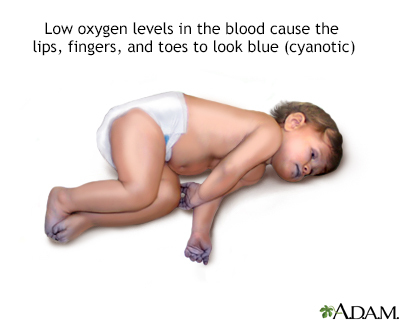 Cyanotic heart disease is a congenital heart defect which results in low oxygen levels in the blood and causes the child's lips, fingers, and toes to look blue (cyanosis).